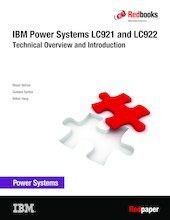 This IBM® Redpaper™ publication is a comprehensive guide that covers the IBM Power Systems™ LC921 and LC922 (9006-12P and 9006-22P)) servers that use the current IBM POWER9™ processor-based technology and supports Linux operating systems (OSes). The objective of this paper is to introduce the offerings and their capacities and available features. Superior throughput and performance for high-value Linux workloads. Low acquisition cost through system optimization (industry-standard memory and industry-standard three-year warranty). Rich I/O options in the system unit. There are 12 large form factor (LFF)/small form factor (SFF) bays for 12 SAS/SATA hard disk drives (HDDs) or solid-state drives (SSDs), and four bays that are available for Non-Volatile Memory Express (NVMe) Gen3 adapters. Includes Trusted Platform Module (TPM) 2.0 Nuvoton NPCT650ABAWX through I2C (for secure boot and trusted boot). Integrated MicroSemi PM8069 SAS/SATA 16-port Internal Storage Controller Peripheral Component Interconnect Express (PCIe) 3.0 x8 with RAID 0, 1, 5, and 10 support (no write cache). Integrated Intel XL710 Quad Port 10 GBase-T PCIe 3.0 x8 UIO built-in local area network (LAN) (one shared management port). Dedicated 1 Gb Intelligent Platform Management Interface (IPMI) port.